It was quite a celebration in Toronto last night (June 11) as Air Canada hosted a VIP group of its top travel trade partners to toast two of its own – Duncan Bureau, who is taking on the role of president, Air Canada Rouge and John MacLeod, as the new vice-president – global sales and alliances for Air Canada. 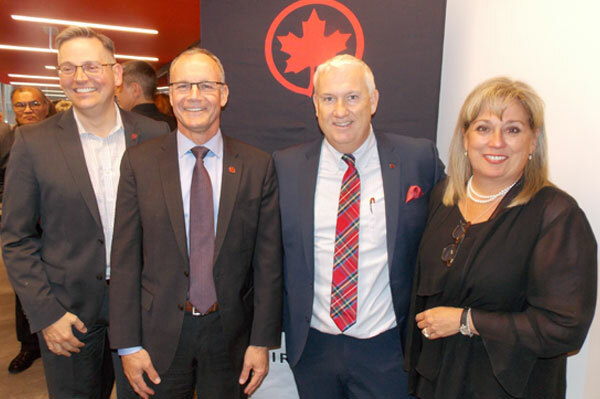 The airline’s executive vice-president and chief commercial officer, Lucie Guillemette and its senior vice-president, revenue optimization, Craig Landry welcomed the crowd of about 100 at Air Canada’s offices in downtown Toronto. Describing Bureau as an incredible personality who is well known around the world, Landry praised him for his four years of work as AC’s VP of global sales. Noting that Air Canada Rouge has been a great asset for Air Canada, Landry said that there are great things ahead for the carrier as Bureau brings his energy to his new role. Landry also welcomed John MacLeod as the airline’s new vice-president – global sales and alliances, observing that MacLeod has been working on alliances for Air Canada for a while now and brings a breadth of experience to his new role. Responding to Landry’s comments, Bureau told the crowd that it has been an “incredible privilege working with you and growing our business” and that he is excited to join the Air Canada Rouge team and continue to work with the trade in his new capacity. For his part, MacLeod told his audience that he looks forward to working with Air Canada’s agency partners and to continue to strengthen that relationship. Celebrating the occasion during the event in Toronto are (l-r) Air Canada’s Craig Landry, senior vice-president, revenue optimization; John MacLeod, vice-president – global sales and alliances for Air Canada; Duncan Bureau, president, Air Canada Rouge; and Lucie Guillemette, executive vice-president and chief commercial officer for Air Canada.